Sugammadex is a relatively new rapid-reversal agent for rocuronium and vecuronium. The drug works by chemically "encapsulating" these NMBA molecules, thus dissociating them from the acetylcholine receptor and thereby reversing the neuromuscular blockade. Early studies suggest that at a dose of 4 mg/kg it can reverse even profound rocuronium-induced neuromuscular blockade within 2 minutes. In a recent review, sugammadex was shown to be effective in reversing rocuronium-induced neuromuscular blockade with no increase in adverse effects compared to neostigmine or placebo. Sugammadex is also effective in reversing vecuronium-induced blockade. The drug is hemodynamically inert, and no concomitant use of an anticholinergic agent is needed. 1. 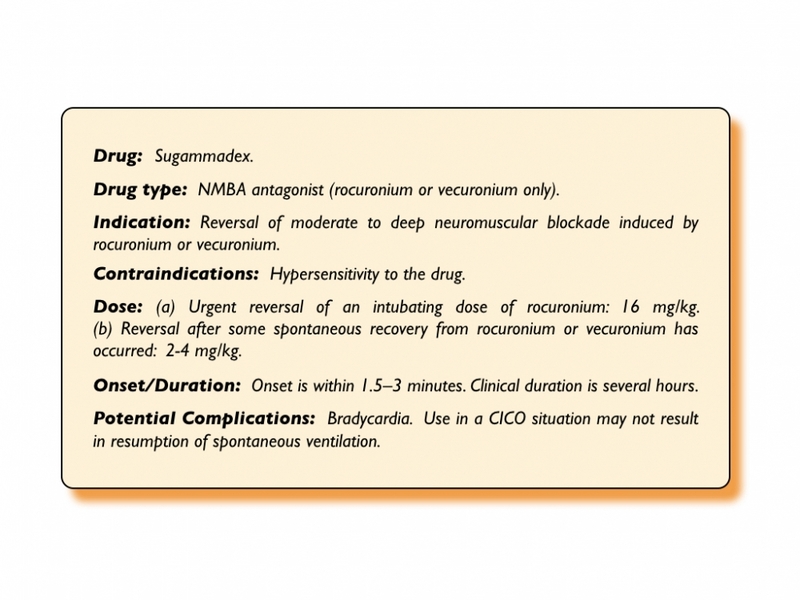 Reversal of neuromuscular blockade following sugammadex can take as long as 12 minutes in 5% of individuals. 2. Despite aggressive preoxygenation, in the obese population and at risk critically ill patients, significant desaturation will likely already have occurred before adequate spontaneous ventilation has returned as a result of sugammadex administration. 3. The preparation time from decision to administration of 16 mg/kg of sugammadex in a CICO scenario is relatively long (> 6 minutes). 4. While the NMBA may be reversed, the accompanying induction agent effect will continue to impair spontaneous ventilation. 5. The clinical trajectory of most critically ill patients after failed intubation and failed mask ventilation is such that their NMBA reversed state will be worse than their pre-airway management state. 6. Many would argue that a patient waking-up during a difficult airway will make further attempts at securing an airway more difficult and that a paralyzed patient provides optimal conditions for further attempts to intubate, rescue oxygenate and ultimately perform eFONA if needed. In summary, in an emergency setting a critically ill patient should not be expected to rescue themselves from a CICO scenario by the administration of sugammadex.